Do you need to build a volume base? In previous posts I eluded to the trend to programme in strength preparation cycles that emphasise ‘work capacity’ to prepare for more higher intensity forms of training. The aim here is to develop a Volume base of General fitness that will augment future performance. Before we get into the detail I should say that the overall aim of any programme should be to provide a training stimulus that will augment performance and minimise injury risk. Any programme aiming to create an appropriate training stimulus must respect the overall training principles of overload, variation and specificity. As a general rule for overload I believe in progressively increasing the intensity of a biomotor ability first before learning to endure that quality. Therefore I really start to focus on the endurance of the anaerobic qualities of speed and power at the end of a training block during the ‘conditioning phase’. a. Progressive Overload– I believe in focusing on building intensity first and this is done very progressively. I believe in the concept of the ‘minimum stimulus threshold’ which basically says that I find the lowest form of stress that can still cause an adaptation and start there. I don’t want to go in at the deep end when lower forms of stress will get the job done. This is why I will start with strength endurance- simply because the load is lower. c. Phase potentiation– for the newbie there will be some physiological adaptations that would potentiate the increased performance in subsequent strength cycles. This is mostly due to neural changes such as greater intra- and inter-muscular coordination, as well as structural benefits to the connective tissue elements. According to Mike Stone the benefits of a Volume Base in this situation relate to hormonal alterations which are based on the concept of creating fatigue through Concentrated Loading. You are producing a lot of testosterone but due to the high volume you’re also producing a lot of cortisol which induces stress/ fatigue. 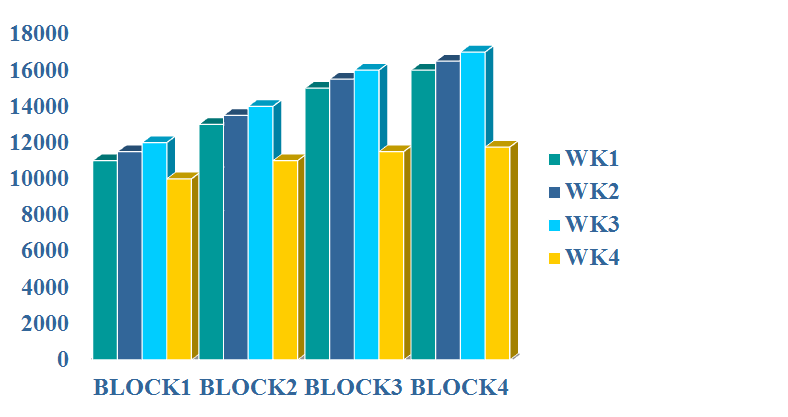 This is achieved by doing sets x reps schemes in the region of 3 x 10. This may seem just like standard hypertrophy work but to a strength/power athlete who likes to lifts heavy things for few reps this is a shock to them! a. CONCENTRATED LOAD (VERKHOSHANSKY 1977) HIGHER VOLUME LOWER INTENSITY (UP TO 8 WEEKS) – MARKED VARIATION – MAY BE ACCOMPANIED BY INCREASED FATIGUE AND DECREASED PERFORMANCE -OFTEN RESULTS IN A DELAYED INCREASED IN PERFORMANCE UPON RETURNING TO NORMAL TRAINING. 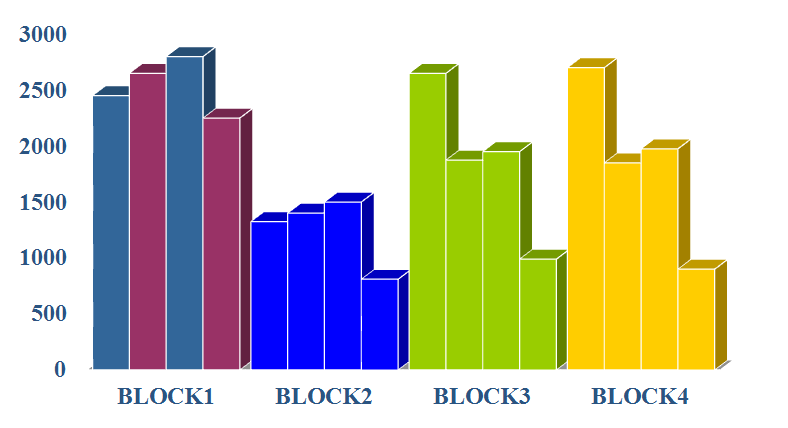 Notice how that once the strength phase has been completed (BLOCK 2) following the concentrated loading (BLOCK 1) there are two noticable spikes in Volume again during the power phases (BLOCK 3 and 4). This type of volume increase called Over reaching. So as well as the volume base that Mike uses there are also mini volume spikes to create that fatigue again during otherwise lower volume cycles (i.e., power cycles). For me I see a lot of the scope of building a Volume base being related to raising metabolism both during the workout and post-workout by exploiting a physiological phenomenon know as EPOC. Fat loss clients are creating a fat loss base by doing lots of exercises with minimal rest to challenge the body both anaerobically and aerobically-meaning they will work their muscles and their cardiovascular system. This is achieved by doing strength endurance circuits such as 5 exercises done with only 30-seconds rest between them. This is great for fat loss because it ramps up metabolism. This type of training is called ‘metabolic resistance training.’ This fat loss base is designed to create more insulin sensitivity so that you are better able to process sugars in your strength phases! For me this is subtly different to what I would do to build a volume base with young athletes because the circuits here are designed to raise metabolism and use exercises which require lower levels of skill so they can tax the muscular and cardiovascular system simultaneously. I try and work these systems separately with developmental athletes. Even though my young athletes will be doing higher reps in earlier training phases they will be doing them at a controlled tempo so heart rate won’t increase as much as in these type of metabolic resistance training circuits. Normally fat loss clients will also do extra metabolic work in the form of sprint intervals which also taps into aerobic recovery from anaerobic work, but I guess my caveat here is to be smart and not programme in exercises modalities that they’re not ready for. I’d rather they do sled drags or bike intervals as a start then progress to running based intervals. For my developmental athletes training I don’t want them to rely on getting their increases in their uptake of oxygen from only ‘recovery’ from high intensity strenuous exercise. I also think young athletes should do some direct aerobic work from actual aerobic intervals of longer duration as well as a little bit of continuous running! Not just maximal effort anaerobic work with aerobic recovery!! I found a great article on the pros and cons of Cross fit because this is perhaps the classic case of doing work for work’s sake. Read the full article here. In a nutshell the problem with building a volume base using things like Crossfit is that ‘You do a little of everything. And the ‘everything’ are all super demanding exercises!!! You do some Olympic lifting, and some powerlifting, and some bodyweight stuff, and some cardio stuff, and some running, and some sprinting, and some intervals, and some circuit training, and some whoop do doop- (my note: all in the presence of fatigue). And you will, yes, “get in shape.” You may even get abs to show off at the office pool party. I actually don’t have any problems with the idea of building general fitness by doing a bit of everything. This is exactly what I am aiming to do with my developmental athletes. I just go about achieving it a different way. I train all the components mentioned above in a given week (which in itself builds work capacity or a volume base! 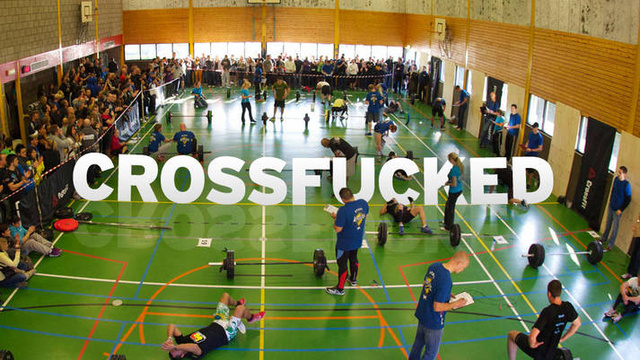 ), but I don’t feel that the way Crossfit is designed is ideal to ‘develop’ general fitness of your average fitness enthusiast because I have concerns about the form of the exercises. I wouldn’t want my athletes to attempt to do Olympic lifts, power lifts and track sprints all in the presence of fatigue. And I think that sort of prescription should be reserved for later training cycles, such as my conditioning phase. I would build my base by training those exercises separately. And I would see Crossfit as the equivalent of sending a recreational runner off to do an Ironman!! http://athleticperformanceacademy.co.uk/wp-content/uploads/2015/05/APA-Logo1-300x156.jpg 0 0 darren.drake http://athleticperformanceacademy.co.uk/wp-content/uploads/2015/05/APA-Logo1-300x156.jpg darren.drake2013-07-15 23:58:042013-07-15 23:58:04Do you need to build a volume base? So I went to see Chris for my 4th PT session and this week I came in a broken man. I have resumed playing 5-a-side football on Mondays and for the last session and this session have been seen to see Chris the following day. Without getting into the details I have a long history of hip related discomfort and I am always getting super tight in my adductors, hamstrings and QL. I believe this is because my trunk and glutes/hamstrings are weak so the other hip extensors take up the slack and beat up on my IT band for pay back!!!!! So football is a bit of a love hate experience right now- I love to play it but I feel really heavy on the pitch; I find it hard to pick my legs up and hate how stiff and uncomfortable I feel after. I guess because I have been weary of my back for so many years (over 10 years now) I very rarely do any sprint work or running so I guess my hamstrings have just got deconditioned at pulling through the running stance!!!! Given that Strength is my goal I am considering not playing 5-a-side but I love it so I am going to have to see how I get on programming a Weights session the day after football! Any way because Chris could see I was struggling we agreed it might be worth doing some hamstring work. So here is the session I did. Interestingly based on my previous posts about work capacity I guess you could call it reverse periodisation because looking at it I started with the just get it done (JGID) muscle conditioning work and finished with the Intensity stuff (Deadlifts)!!!! I had to keep one leg straight while I lifted the free leg and rotated it out to the side. This gave me a nice stretch on the lower back and worked my obliques. I guess you could say we flipped the ‘typical’ order on its head, starting with work capacity work and finishing with the strength lifts. So there you have it. One session of hamstring abuse!!!! http://athleticperformanceacademy.co.uk/wp-content/uploads/2015/05/APA-Logo1-300x156.jpg 0 0 darren.drake http://athleticperformanceacademy.co.uk/wp-content/uploads/2015/05/APA-Logo1-300x156.jpg darren.drake2013-07-11 11:54:042013-07-11 11:54:04Hamstring DOMS!! In yesterday’s post I gave you my own take on work capacity. To give a bit more detail to this topic Dan Cleather talks about training three components of strength that have different volume and intensity demands. I think we all recognise these elements no matter what you call them. I call them Main Power/Strength lifts, Secondary strength lifts and muscle conditioning components. Like Dan I train the three components concurrently and these form the basis of every weights session. I wrote a Blog about this concept of changing the emphasis of a session previously. See it here. Remember that the high intensity bit of the session doesn’t necessarily need to be high intensity in all cases- with a development athlete you could be working on developing tripple extension technique, so this aspect is as much about quality as it is about intensity. Make sure that the work is done at a high quality. 6 reps of the following done 3-5 times with 30-60 seconds between sets. I personally would see this as a GTG type work but done with a work capacity focus. I personally stay away from this type of work capacity work with my athletes as many of them will be learning the barbell techniques as part of my Intensity/quality bit. I prefer this type of work capacity work with my developmental athletes using lower skill exercises that I will do at the end of the session using more JGID type programming. Hope this gives you some ideas!!!! I am writing this blog post currently suffering from the affects of last night’s session with my trainer Chris Burford (more on this later) and have been reflecting on an article I just read by Dan Cleather in the latest UKSCA S&C journal. It’s a new column called ‘Strong foundations,’ and it features contributions from experienced S&C coaches outlining their philosophies. Higher intensity training will lead to the biggest return in terms of improvement in the short-term. However, lower intensity training is necessary to aid in recovery so that the athlete is fresh for the priority sessions or ‘hot sessions,’ as Dan referred to them as. Dan also suggested that if you only do high intensity training there is the potential for stagnation. So what is work capacity? Most comprehensive S&C programmes these days usually have work capacity in the programmes in various forms. For advanced athletes its the filler and/or finisher of a strength session. It can also be a stand alone work capacity session be it repeated sprints, sled pushes, circuits, barbell complexes etc. My contention is that Work Capacity will automatically increase as you get stronger in these athletes (this is another way to increase it) so my question is how much extra ‘work for works sake’ do I need to be doing to increase general fitness? And how does general fitness help me achieve a specific goal? I know that the more ‘work’ I do the more that cuts into my recovery ability- which is vital to get me ready to do my ‘high intensity’ sessions when I need to be fresh!!!! So I don’t just want to be doing mindless work. Let’s look at some of the applications of work capacity training! Below is another way of getting more density. Just have a few supplementary exercises after the main ‘strength’ exercise where you can either rep out on the last set (exercise 2 in example) and/or finish with some high rep body weight exercises. Work capacity: Do more work in the the day, the week. For me work capacity is not just about getting more work done in each session by targeting the above qualities (basically things you can do tired because it’s just about getting it done). It’s about getting more work done each week, month, year by doing more sessions. This way you are building up the athlete’s ability to handle more and more work without any one session compromising their recovery ability. 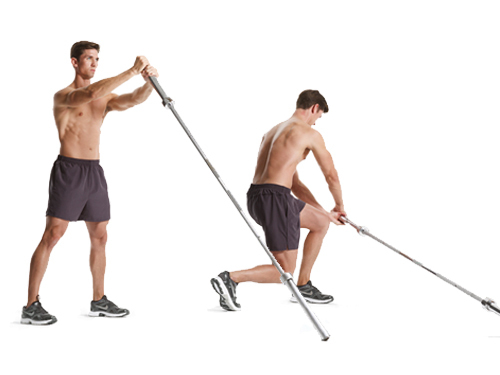 It basically recommends use of extra recovery work outs, workouts to target weak points, specific work capacity sessions such as dragging a heavy sled for 200 yards then resting 30-45 seconds. If you did the above morning you would have developed a large work capacity no doubt! And one of the things I do with our adolescent athletes is slowly introduce more sessions in their week so they get used to having sessions every day and then on some days double sessions! The second thing I wanted to comment on was Dan’s point about needing to build a volume base. So do you need a Volume base before performing Higher Intensity work? Traditional linear periodisation (such as is still prevalent in track and field and triathlon) focuses on building volume first to get the miles in and then progressively build intensity. Do you need a volume base? For me the type of base I need to develop is a movement competency base so for me the reason I might focus more on higher volume training as a base is because it enables me to get more practice (more reps) in a particular skill. Phase potentiation. Some training modalities serve to potentiate/ enhance the gains made in the subsequent phase. Could developing the slow twitch muscle fibre characteristics enhance one’s ability to develop greater force production during more demanding tasks such as maximal lifting in later phases? Or help recovery to be faster between sets in later phases because of more efficient energy pathways? Skill acquisition– lower intensity higher volume work enables high levels of repetition to enhance skill acquisition. This is my strongest case for doing more volume earlier in a training cycle. Tissue integrity– lower intensity higher volume work prepares the connective tissues for the later training phases. Take the squat for example; in the squat the lower back might fatigue and in return the hips will rise faster than the chest. The lever becomes longer, the stress becomes greater, and the already fatigued muscle tires faster. And soon we are seeing squat-mornings. So perhaps some work capacity training of the supporting local muscle system is necessary to create stability strength before going onto maximal strength training to tax the gross muscle system. I have just done a google search on work capacity and have looked for evidence of coaches who are referring to the need to do work capacity first in order to prepare for more high intensity training. Here are some quotes. I have put the full link so you can read the comments in context. Brendan Chaplin: ‘I do a lot of work capacity circuits to build general fitness in my athletes. I think many of us do. If you don’t have the fitness to train for strength how the hell can you actually get strong? Or powerful? Or build a high level of endurance’? 1. start adding in more density and capacity to your strength workouts to gradually build conditioning by using muscular endurance high reps to start and then progress to supersets during the strength phase and the occasional use of reps to fatigue in the last set. 3. start adding additional work capacity workouts that are separate to your main strength workouts and are built around things that you can do while tired with sound technique. Bad things happen to novice trainees when they start believing themselves capable of adding in sprints 2x per week along with barbell complexes sometime in the middle. Ease yourself into it. Below is Tip 7 from an excellent article written by Eric Cressey on how to incorporate sprinting into your conditioning workouts to build ‘work capacity.’ For the full blog click here. 7. Generally speaking, sprint before your lower body strength training work, not after. In this case, the intensive lower body work is consolidated into three 24-36-hour blocks (Mo, We-Th, Sa). Conversely, I’ve also met lifters who like to sprint at 70-80% effort the day after a lower body strength training session, as they feel like it helps with promoting recovery. So there you have it. A complete overview of my take on work capacity and the need to build a volume base!!! So how did I feel after the first session? Well, the truth is it hurt pretty bad. I actually went into the session with Chris with a sore back. The previous week I had done a heavy deadlift and had also been demonstrating a lot of KB swings to my athletes which is why I think I was struggling. I had the worst muscle soreness in my quads and my back was still sore from previous week’s training before seeing Chris. What was most noticable was than it felt like my core had gone to sleep- I just couldn’t get that bracing feeling all week and I guess they were just taxed to the max from the maximal effort! I added in Swiss ball jack knifes 2 x 10 (see below) with a rotation as well as Swiss ball back extensions. For Kettle bell I added in Turkish Get ups 1 x 6 each side. The squat routine was the same only this time I was more accustomed to it and knew what to expect. This time Chris didn’t need to lift me all the way up, he just nudged me out of the hole and I got myself the rest of the way up. This time I actually recovered a lot faster. I didn’t have anywhere near as much muscle soreness and was able to lift again on Tuesday after I only previously saw Chris last Thursday. I think Chris is cunningly increasing my work capacity as I now did a more extensive extended warm-up before the main squat. 3. KB side planks hip lifts 2 x 10 each side- this is so hard!! Let’s see what is in store next week! I feel much stronger in my core and I have modified my squat technique slightly so I am sitting forward slightly more with the bar slightly lower on my back so I can push through my abs and glutes more. I don’t get knee pain and now it is feeling easier to get the reps done!!!!! Update on APA Coach Daz's latest quest for maximal strength! So guys if you’ve followed my previous posts on last year’s ‘Get Lean in 12 weeks’ you’ll know that this year I’ve been focused on ‘Getting strong in 12 weeks’. My first session was a bit more talking based so that Chris could establish my goals, my training history and my injury history. I also brought in a 3 day nutrition log. I told him I wanted to squat 2 x my bodyweight for 1RM (150kg). I told him I typically never lift for less than 5 reps and that typically heavy squats would aggravate my knees. I also said that I know that I am weak in the core but kid myself that doing compound lifts will be sufficient. I said I reckoned I could lift 100kg for 1 rep and I comfortably do 70kg for 6 reps. I realised this is an area I just can’t afford to neglect. I normally skip any sort of direct core activation as part of my weights warm-up and usually just do a barbell complex or a kettlebell routine. What is probably worse is that I don’t do any core either in between my main lifts (as fillers) or at the end (as finishers)!!! Having Chris make me do these is giving me the impetus to do them myself so it doesn’t hurt so much when I am with him! Kettle bells (KB) are something I was already familiar with. I was originally taught that the swing needs to be done from a stiff leg and that this minimises the stress on the back. So for this reason I have always done it as more like a dynamic Romanian Deadlift (RDL). But Chris said that the squat swing (where you bend more at the knees is focused on getting that hip drive that you need to teach the explosive power needed on a heavy squat). I have been convinced of this because when I did the squats afterwards I could really feel the benefits of having fired up the hip drive. Notice I didn’t say fire up the glutes!! Some S&C coaches will say it is impossible to not fire the glutes otherwise you couldn’t stand up but I guess what I am saying is the KB helped groove the pattern!!! Chris then proceeded to ask me to do a warm-up set of bodyweight squats to see my general technique. I did about 1 set of 10. Then I got under the bar and did another 10 with an empty bar (20kg). Technically he said I was very proficient so we carried on by doing a set of 5 reps with around 60kg, a set of 3 with around 80kg and a single with around 100kg. Chris wanted to determine at what point I reach failure and then he helped me lift it up. I’m not talking about ‘failure’ in the sense of muscle failure that you would experience when you do hypertrophy eccentric type work and you reach fatigue and physically run out of gas. This is the sort of mechanical central nervous system failure when you just can’t recruit enough of your fast twitch fibres to get the force production necessary to lift it up! I was a little surprised by this because I have always been trained to view my training as having to ‘earn the right’ to lift something heavy. Actually Chris said that the biggest barrier to lifting heavy is to be mentally able to know that you might not get back up. Now as long as you have a competent spotter or safety squat bars then there is no problem with this. I used to think that you just needed to keep nudging the weight up one session at a time and now I can see that in my situation this will accelerate my progress. I say this because I have an extensive lifting background and I have an extremely competent spotter in Chris who can feel exactly the point when I am struggling and then give me just the right amount of help to get out of the hole!! We then went back to a lighter squat and I immediately felt the benefit of having activated my core to it’s limit! I will give you some more updates on the next few sessions in my next post. http://athleticperformanceacademy.co.uk/wp-content/uploads/2015/05/APA-Logo1-300x156.jpg 0 0 darren.drake http://athleticperformanceacademy.co.uk/wp-content/uploads/2015/05/APA-Logo1-300x156.jpg darren.drake2013-07-05 12:24:292013-07-05 12:24:29Update on APA Coach Daz's latest quest for maximal strength! So to set the scene I came in at 16% body fat on the bio-signature when I went for my assessment at UP Personal Training in Mayfair last September. I told Jonny, my trainer that I wanted to maintain my muscle mass and get down below 10% within 12 weeks. His advice was to do a 2-week period to improve my sensitivity to insulin by taking away starches and sugars and only eating green vegetables for my carbohydrate intake. I was allowed up to 300 grams protein per day to meet my energy requirements and on training days I could have a 50g whey protein shake!! To be honest I found it pretty hard to get 300 grams of protein down me each day. I felt hungry probably because I didn’t hit my daily protein requirements and was really missing sugar during the first few days!!! Weeks 3-4: Carbohydrate in shake and meal post workout! I was worried I had lost muscle because I had lost some weight but Jonny said as long as your protein is high and you’ve been training you’re okay. What it will be is water and muscle glycogen, nothing else. So because I had probably lost some body fat too, I could now add in carbs in the shake after training (40 grams) and in the meal after, another 40 grams. In the shake, you have to go for a fast release carb like dextrose, and gluten free slow release carbs in the meal after, like sweet potato or whole grain rice. So at the half way point I’m feeling like I’m not able to increase the weights on my strength exercises. I feel weak. So, we agree that I take a day where I have gluten free carbs at every meal except breakfast. Also, I dropped the training volume by 50%. So I did all the exercises at the heaviest weights I could, but did 50% of the sets. Weeks 7-8: 2 meals post workout I’m allowed Carbs! Ok, so now I add in some sweet potato or rice in another meal post training, approx 50 grams of carbs. Now I ramp it up to 140g carbs and 70g protein TOTAL in two separate shakes post workout (70g CHO / 35g protein in each shake). Plus around 80g CHO per meal after that. I also have Carbs (starches/sugars) in the evenings on non training days. It’s July 2013 and I recently measured myself with bio-electrical impedance at 77 kg and 12.9% body fat. I’m going to post on my current work-outs which are focused on getting stronger. I still ‘think’ about the strategies I used to get lean and as a principle I try and stick to the idea of having less starches/sugars on non-training days!! Hope you found the information useful and let me know if you want any more information on the whole process! So how did I lose the 7% body fat? Caloric content of fat, protein, carbohydrates and alcohol. Total: 1,778 calories (my interpretation is that in order to hit the 2000 kcal we probably exceed the GDA in one or more of the food components! I’m not entirely sure what the fat and carbohydrate would have been. We just used portions for each meal rather than specific amounts but the fat would have to have been a lot more because I was eating protein at every meal and snack! The carbohydrates must have been way down because I was having around 4 portions of vegetables a day and a typical serving is around 85g per serving. The key thing to point out is that while I did maintain a normal amount of Carbohydrates because they were only in the form of vegetables the energy value of those grams was really low!!!!! Day 1: 1 lean ground chicken patty (homemade burger) and a handful of macadamia nuts. Day 2: 1 steak (ideally go for something “wild” like venison if you are able to eat that) and a handful of cashew nuts. Day 3: 1 to 2 lean turkey burgers and a handful of walnuts. Day 4: 1 salmon fillet and a handful of brazil nuts. Day 5: 1 cod loin and a handful of hazelnuts. 4. Post workout – you must have a protein shake (50gms of whey protein) immediately after you exercise. 5. No beer at all, and restrict alcohol intake where you can. Restriction means a small glass of wine. 6. No candy type sweets. If you have to snack on something sweet a far better option would be chocolate covered brazil nuts. So that was the nuts and bolts of the new nutritional plan which I was asked to stay on for the first two weeks. In the next blog I will explain how the carbohydrates were slowly reintroduced back into my food.!!!!!! http://athleticperformanceacademy.co.uk/wp-content/uploads/2015/05/APA-Logo1-300x156.jpg 0 0 darren.drake http://athleticperformanceacademy.co.uk/wp-content/uploads/2015/05/APA-Logo1-300x156.jpg darren.drake2013-07-03 20:44:442013-07-03 20:44:44So how did I lose the 7% body fat? How I lost 7% body fat in 2 months! A lot of my posts so far have focused on the theory of principles of training so in case you think I just talk about training I thought I would share with you a little insight into my own training goals over the last year! First things first I should say that I always use a personal trainer / strength & conditioning coach even though I am one myself! I strongly recommend that everyone has their own trainer if they are serious about achieving a goal. I think this is especially important if you are a trainer yourself. I find that I am constantly challenging myself to make decisions about what my athletes need and sometimes I don’t give myself the same attention. I like to think about what I would like to achieve and then seek out the best trainer to help me achieve this. The goal could be a performance goal such as lift a certain amount of weight or an anthropometric goal such as to achieve a certain body fat percentage. It might seem strange to pay someone else to train you if you pretty much know what to do yourself but I like paying someone because it makes us both accountable for achieving the goal. It also makes me a better coach because I can relate to my athlete’s experiences, and know what things could work well to motivate them that my own trainer has done with me. Last year I wanted to get under the 10% body fat mark inspired by a Men’s Fitness article in which a writer for the magazine Joe Warner was taken through a 12 week training phase to get them in cover model shape. What got my attention was the fact that this was a typical guy who had a similar body type to me. He was 6ft, around 12 stone and 16.3% body fat. Photos which were taken every 4 weeks and showed his gradual transformation to cover model physique where he gained a few kilograms and leaned out to 5.5% body fat. 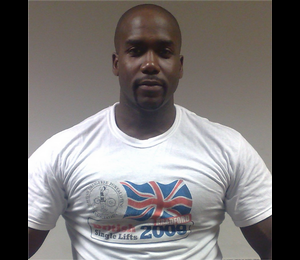 The Men’s Fitness programme was designed and carried out by Nick Mitchell who owns Ultimate Performance in Mayfair, London. Having made some enquiries I found that the price of personal training with UP was going to be out of my budget (around £150 per session!!!) 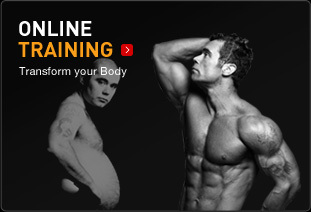 So, I arranged instead an on-line training advisory package (see their advert below) with one of the trainers at Ultimate Performance, and basically said I wanted to go through the same process. The on-line process involved me filling out a medical PAR-Q and an on-line waiver as well as several forms to describe in length my goals, nutritional habits and general training history. For £450 I would get 3 months of training plans designed to suit my specific goals as well as an assigned trainer who would be available to discuss the training via email as often as required. Once the payment was processed I was assigned to Jonny Rees, who would write my programmes. As I wanted to have some measurements taken I also opted to pay another £150 to have my bio-signature done. 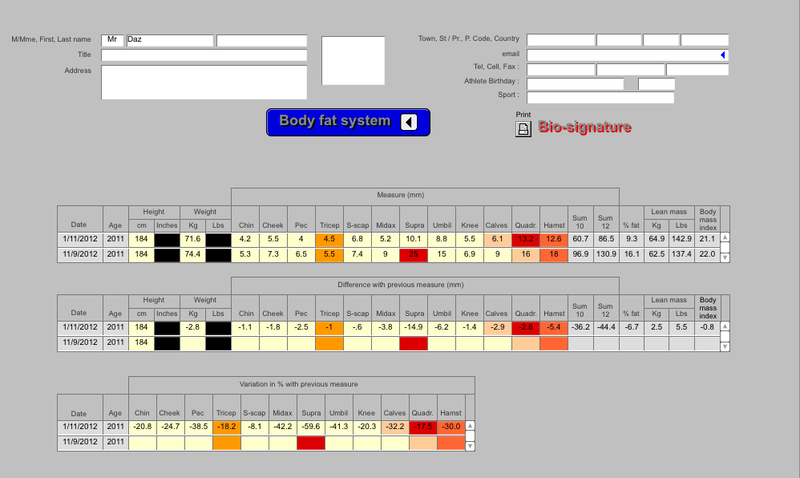 This is a body composition assessment based on the Poliquin method using skin folds. Now to cut a long story short I had the bio-signature at middle of September and one more re-test 2 months later at the middle of November. I couldn’t wait for the full 3 months because I was leaving the country on business before the 3 months ended. I can say now that 90% of this change was based on a nutritional intervention. For those of you interested I will explain the process I went through in my next blog. By the way, I am writing this blog 6 months later and recently had a body fat % (admitedly from bioelectrical impedance on Tanita scales) of 12.9% and a body mass of 77kg!!! This is because I now have a goal to get strong and squat 2 x my body weight. I have had 3 personal training sessions with local strength coach Chris Burford and I will make sure I keep you guys in the loop with how I am getting on with that too!!! http://athleticperformanceacademy.co.uk/wp-content/uploads/2015/05/APA-Logo1-300x156.jpg 0 0 darren.drake http://athleticperformanceacademy.co.uk/wp-content/uploads/2015/05/APA-Logo1-300x156.jpg darren.drake2013-07-02 23:08:222013-07-02 23:08:22How I lost 7% body fat in 2 months!